Hold the presses once again – the announcement of the discovery of the new painted stone may have been a bit premature! This morning, in the cold light of day, the jury on this is still out – is it or isn’t it? No-one can decide. The stone is definitely “coloured”, with bands of yellow, black and red, but whether some of this is natural colouring, the effects of heat or applied colour we can’t, at present, agree. Unlike the painted stones discovered last year, there would also seem to be little depth to the colour. Whether or not the stone was painted or not, it would seem that this stone was perhaps specifically selected due to its colouration for insertion in Structure Eight. Hopefully post excavation analysis will supply an answer! Elsewhere on the site, the brisk pace of work continued. In Structure Ten, Antonia, and her team, continued to work on the back wall behind the dresser and defining the elusive entrance passage. Not far away, Adam found a large block of finely incised stone within the robbing debris of the west wall. At first, the incisions appeared totally random, but with closer inspection, chevrons, diamonds and cross-hatched patterns can be made out. Perhaps the star find of the day came from Structure Eleven, where Kim was trowelling close to a wall when a stone ball “popped out” of a small recess built into the wall. It is a beautiful, fine-grained, soft pink, igneous rock, which has been very carefully ground into a near perfect sphere. Purpose? We have no idea. But once picked up, it is one of those things you become reluctant to put down. 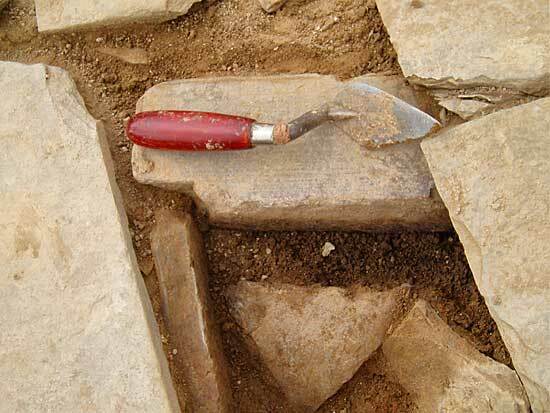 In Structure Eight, more work was done on slate removal and on defining one of the hearths. The long slabs that form the hearth’s sides have emerged and it turns out that one has a carefully cut notch, into which the adjoining slab fits perfectly. These Neolithic folk were clearly not shoddy builders. Over in Structure One, the curious oval wall, which so constricts the centre of the building, is gradually being taken down. Much of it has gone already and its absence transforms the central area. It is now possible to have a good feel for the internal space in Structure One during its earlier phases. In the northern corner, Hugo, and his team, are working on what appears to be a later, and rather ephemeral, building. They have removed a good deal of the midden overburden and walling is appearing with what seem to be mini-piers. It is likely to be well into next week before a coherent pattern emerges. 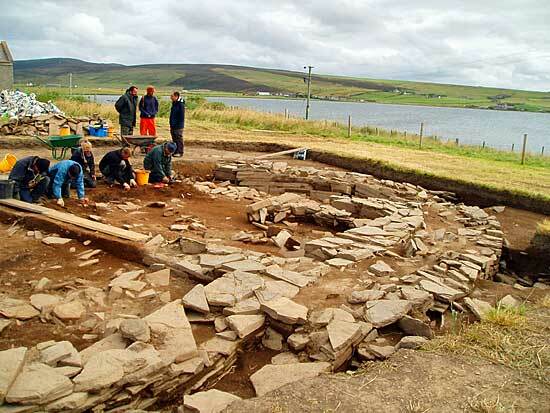 Our visitors today have included Steve Dockrill and Julie Bond – two distinguished archaeologists, from the University of Bradford, who have extensive experience of working in Orkney and Shetland. 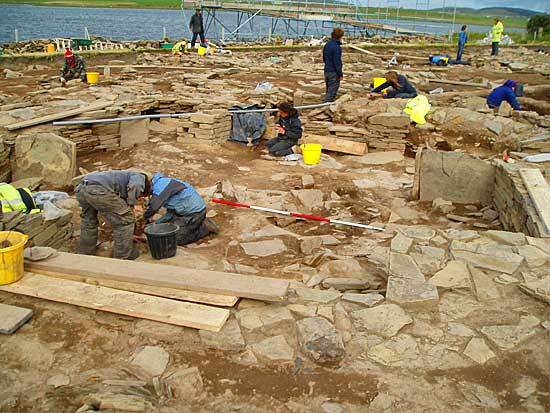 Steve was responsible for excavating and publishing the site at Toftsness, in Sanday, and they are both now involved in work in Rousay, in collaboration with the Archaeology Department at Orkney College, University of the Highlands and Islands. The BBC have also visited in preparation for more filming with Neil Oliver in coming days, which will eventually lead to a special television programme devoted to our site. The first week is now over and Nick, the site director, is very happy with progress. A number of questions have been answered but, as usual, a plethora of new ones have emerged. We look forward to next week with heightened expectations. Hi from John and Gill. Sadly this is our last day; if only we could stay for another week. This must be one of the most beautiful and exciting excavations to be involved in. I was with Dave when he found the second ‘painted stone’, what a moment! We came to Orkney last year with Una for a holiday and we were so overawed by the archaeology we asked if we could come on the famous dig. How privileged all three of us are to have been accepted. John has over 40 years digging experience, but Una and I are part-time archaeology students with shinier trowels. I cannot describe the beauty of this place, even with the fickle weather. 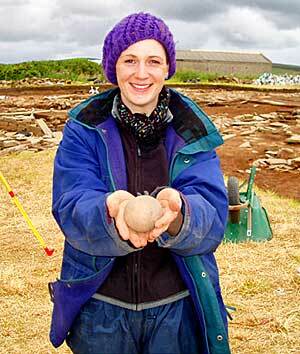 Hoy changes its mood by the minute, and so do the lochs lapping close to the excavation edges. Then you look up from the trench and there are Stenness and Brodgar stones, it is almost a dream. Mind you, this isn’t for the faint-hearted! The knees and back are aching, hair is full of dirt and the constant wind whips everything away if not pinned down. If you can visit, the guided tours are superb, and there is ‘Spot the NoB’: how many diggers wearing a ‘NoB’ wooly hat? The hats are available to buy in the OAT shop on site. I do hope we can come again. Thank you to all for making this such an unforgettable experience.